After their wedding ceremony at The Elms Mansion on St. Charles Avenue, the couple and their guests boarded several chartered streetcars and headed to the French Quarter for the reception at the Omni Royal Orleans Grand Salon Ballroom, with the streetcars dropping their passengers off on Canal Street, which is at the edge of the French Quarter and just a few blocks from the reception venue. Each car was provided with its own pair of musicians for providing live and festive New Orleans jazz entertainment to the guests as they traveled to the celebration at the hotel. The Unique Weddings in New Orleans planning and coordination team made sure the event was executed flawlessly. 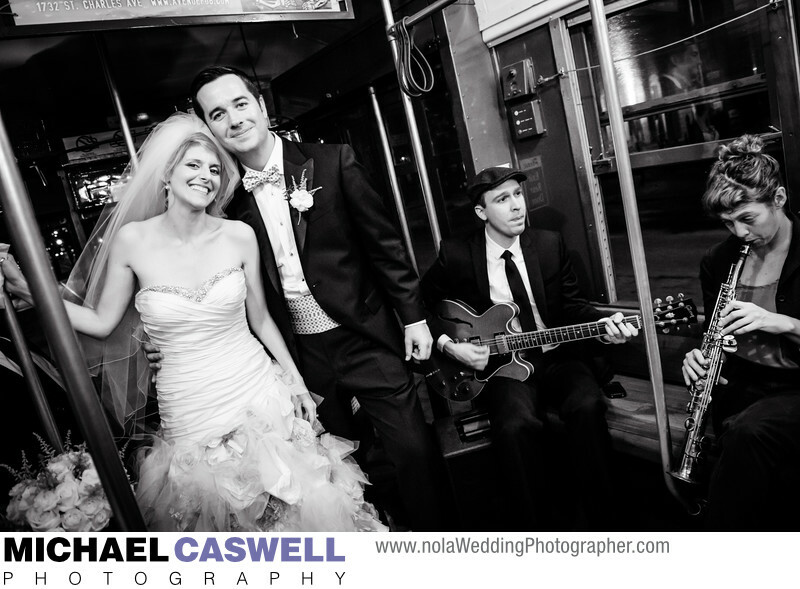 A streetcar departure at the end of a wedding as a send-off, or in this case using them as a way of transporting guests to the reception is one of the benefits of The Elms' location right there on the St. Charles Avenue line, and it's one of the few wedding venues in New Orleans that can offer this amenity. In addition to serving as wedding day transportation, a chartered streetcar can also serve as the actual ceremony venue! While obviously not suitable for every couple, it's a truly unique and unconventional way to get married in New Orleans.